CORE CLASSES equip participants for practical life application of core biblical truths. Core classes will not be offered in spring 2019. BIBLE FELLOWSHIPS combine Bible study or sermon-aligned discussion with fellowship and prayer. Join anytime! ELECTIVES & WORKSHOPS are special-interest classes that supplement our regular class offerings. 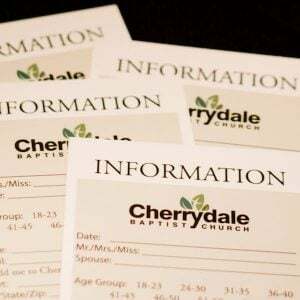 CHERRYDALE EXPLORED is our newcomer’s class, held during the odd months during the 11:00 am worship service. Sermon Bible Fellowship Bob Kelso & Joe Kilner Review of Sunday Message Room 119 None / Join anytime! Chinese Bible Fellowship Wayne Hsu & Charles Li Disciple Training Room 117 None / Join anytime! Sermon Bible Fellowship Greg DuHart & Lindy Wolner Review of Sunday Message Room 119 None / Join anytime! Book-of-the-Bible Fellowship Kirk Heldreth 2 Peter Room 114 None / Join anytime!